 JDDW 2017 in Fukuoka was a great success. in International Session are proudly announced. The Best Presenter Award in International Session page has been updated. Registration for the Digital Poster Data has been closed. Please contact us related to the Digital Polster. Early application for waiver of registration fees for foreign exchange students in Japan was closed. Registration Site for general presentations has been updated. Floor Plan, Exhibition pages have been updated. Sponsors page has been updated. Schedule/Abstract Search System page has been updated. Message from JDDW2017 Chairperson, Message from JDDW President, pages have been updated. Notification and Request page has been updated. Application for Hands on seminar has been closed. Abstract status notifications have been sent to all authors by e-mail. If you do not receive notifications, please contact the secretariat. Hotel reservation applications has been updated at the Accommodation page. Media and Press page has been updated. Hands on seminar page has been updated. Access to Venue page has been updated. Presentation format (For Theme Sessions), Presentation format (For Digital Poster Sessions) page has been updated. Abstract Submission, Program pages have been updated. Travel Award Program, The Best Presenter Award in International Session pages have been updated. Copyright © JDDW 2017. All Rights Reserved.